Wondering how that lovely, fragrant and flavorful white basmati rice is made in Indian restaurants? Good news, it's easy to duplicate at home, and, the recipe is vegetarian, vegan, and dairy-free and gluten-free. 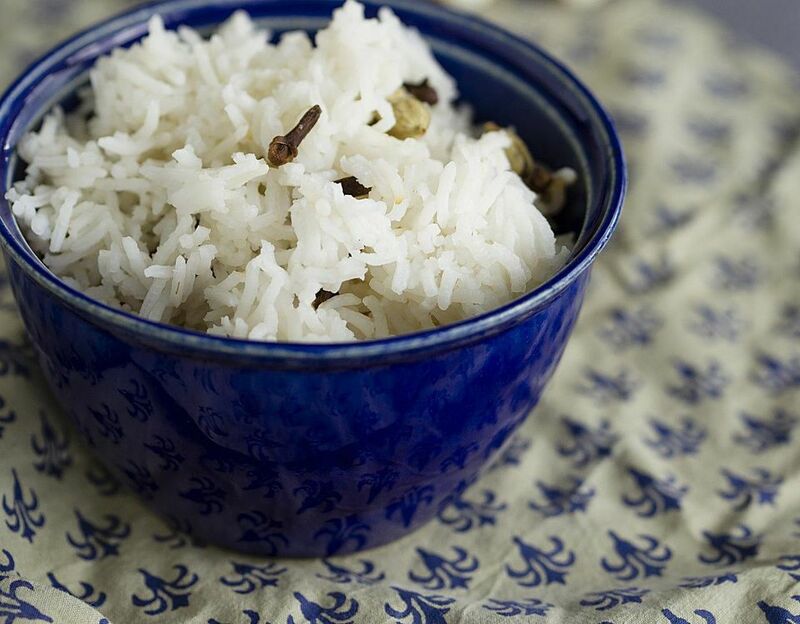 This restaurant-style Indian-flavored basmati rice recipe is seasoned with cinnamon, whole cloves and peppercorns with a bay leaf, all of which combines to create a wonderfully flavorful rice side to accompany just about any Indian vegetable dish. Vegetarians and vegans can pair this simple rice dish with Indian-spiced dal, curried vegetables or any kind of vegetarian curry for a basic and easy vegetarian meal. This simple Basmati rice recipe is also gluten-free. Cover the Basmati rice with water in a small bowl and set aside. Allow the rice to soak for 20 minutes. Once the rice is done soaking (after 20 minutes), drain any excess water and move on to the next step. Over medium heat, warm the olive oil or peanut oil in a sauté pan or large skillet and add the cinnamon stick (break it in half), bay leaf, cumin seeds, whole clove and peppercorns. Warm these spices for just 10 to 15 seconds, then add the chopped onion and heat until the onion is well cooked, about 6 to 8 minutes. Add the soaked but uncooked Basmati rice, and toast, stirring, for 20 to 30 seconds, just until lightly browned, then add the water and bring to a boil. Once the water is boiling, reduce the heat to a low simmer, cover, and allow the rice to cook for 15 to 20 minutes, until rice is cooked through and liquid is absorbed. You can stir occasionally, as needed. You can, if needed, use any kind of rice in this recipe, but the delicate shape and natural fragrance of Basmati rice are what really pulls this dish together. Basmati is rarely the cheapest variety in the grocery store, but you really want to taste it in this recipe.